New Caledonia’s maiden FIFA U-17 World Cup match was a baptism by fire as France outclassed them 7-1. To make matters worse, two of those goals were by their own players – Bernard Iwa and Kiam Wanesse. But a 1-1 draw with the fancied Japan in their last Group E match has infused hope for football in New Caledonia, France’s overseas territory which is headed for a referendum on independence next year. An archipelago in the Pacific Ocean with 280,000 people, New Caledonia has struggled to find their next Christian Karembeu or someone even better . 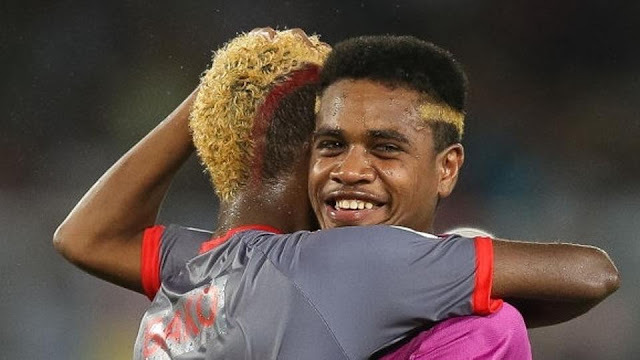 The likes of Jekob Jeno, who equalised dramatically in the 83rd minute against Japan, and Une Kecine, who became the first New Caledonian goalie to block a penalty shot at a FIFA tournament, have given the group of islands hope. Karembeu, the only star to have emerged from the archipelago, had 53 appearances for France from 1992-2002. He was a member of the French teams that won the 1998 FIFA World Cup and Euro 2000. Before Karembeu, striker Jacques Zimako was the first Kanak (Melanesian) footballer to have played for France from 1977-81. Striker Marc Kanyan Case (1968-77) and defender Antoire Kombouaré (1982-98) made it to top French clubs. Post-Karembeu, the best that New Caledonian footballers managed was play for lesser clubs in France. They included Georges Wadenges, father of the U-17 team defender Sidri Wagenges, and Dominique Wacalie, the 35-year-old coach of the team that took part in the first stage of this World Cup. Though New Caledonia has a total land area of 18,576 sq km, much of its football talent come from the Îles Loyauté (Loyalty), a smaller group of islands 100 km from the mainland where capital Nouméa is situated. More than 64% of people in New Caledonia live in Nouméa. Half the squad that played in India come from the Loyalty Islands -- Lifou, Ouvéa, Maré and Tiga. Wacalie is from Lifou, as are Karembeu, Zimako and Case. “Football is the king’s game in Caledonia. Everyone plays there everywhere – on the beach, any piece of land, before going to church, in the smallest of spaces. The World Cup in India has been a great learning curve for our boys,” Wacalie told HT via email. The boys, Wacalie felt, took time to find their feet but against Japan showed what they can really do. “The experience in India will take football in New Caledonia to a new level,” he said.